Atlantic Cities profiled In Motion, a community-based program in King County, Washington, that encourages people to use alternative travel modes. A candlelight vigil was held last night for Sandhya Khadka, who was killed by a truck while crossing 5th Ave NE on her way to catch the 41 bus to get to work and school at North Seattle Community College. King County Parks is beginning work to reconstruct and pave the north section of the East Lake Sammamish Trail. When complete, the trail will create a paved route from the Burke-Gilman Trial in Seattle to Isaaquah. 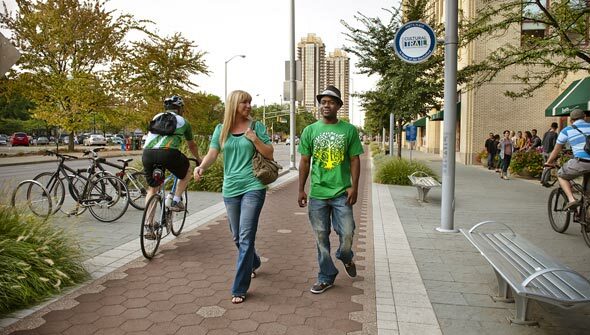 The Alliance for Walking and Biking published their biennial Benchmarking Report. The findings include a positive correlation between the number of people walking and biking in a city and the strength of the city’s biking and walking advocacy organizations. Philadelphia’s $200 million plan to cap the I-95 Freeway in order reconnect the Delaware River waterfront with the rest of the city and greatly improve upon walkability could generate $1 billion in private investment. Indianapolis’ Cultural Trail, a bike and pedestrian thoroughfare that contains a number green infrastructure features, is helping spur revitalization in the city, while boosting Indy’s mobility options. Oss, in the Netherlands, now has a 500-meter stretch of a glow-in-the-dark road. The photo-luminizing markings absorb daylight and then release a green glow for up to eight hours in the dark. Participants at World Health Organization’s 4th High-Level Meeting for Health, Transport, and Environment in Paris set priorities to ensure green and healthy mobility and transport in order to secure sustainable livelihoods for all, linking the promotion of health and sustainability to socio-economic justice.